Dell has been delivering quality products in the segment of computing and technology over the years. Owing to the success of its previously launched Venue 8 7000 series, the brand has been extended with a better design and more productivity. The new tablet is named as Venue 10 7000. The tablet has a bigger screen of 10.5 inches. It has a 2560 x 1600 pixel OLED display. The tablet is encores an Intel Atom Z3580 Moorefield processor and features 2GB of RAM.The tablet has a huge 7000 mAh battery as compared to the Venue 8 7000’s 5900mAh battery and lasts up to 15 hours. The battery along with the tablet’s stereo speakers fit inside the thick cylinder that runs along one end. You can also fix the tablet to an optional keyboard dock to use the Venue 10 7000 as a notebook. It has a thickness of 6.2mm. The Venue 10 weighs 598 gm which is almost twice the weight of Venue 8. The major weight is due to the cylinder. The Venue 10 7000 features an Intel RealSense camera and software that enables you edit the depth of field of photographs even after they have been snapped and saved to your device. The front camera is 2 MP and rear camera is 8 MP. The rear camera supports 3D. Dell also specifies that the tablet will support Google’s Android for Work platform that lets users create personal and work profiles on a single device. The version of Android is expected to be the latest lollipop 5.0. The tablet has support for micro USB port, headphone jack and a MicroSD slot that can expand the storage up to 512GB. Venue 10 7000 supports wireless technologies so the tablet screen can be mirrored on monitors and televisions. The tablet is priced at $629.The optional keyboard dock costs $130. 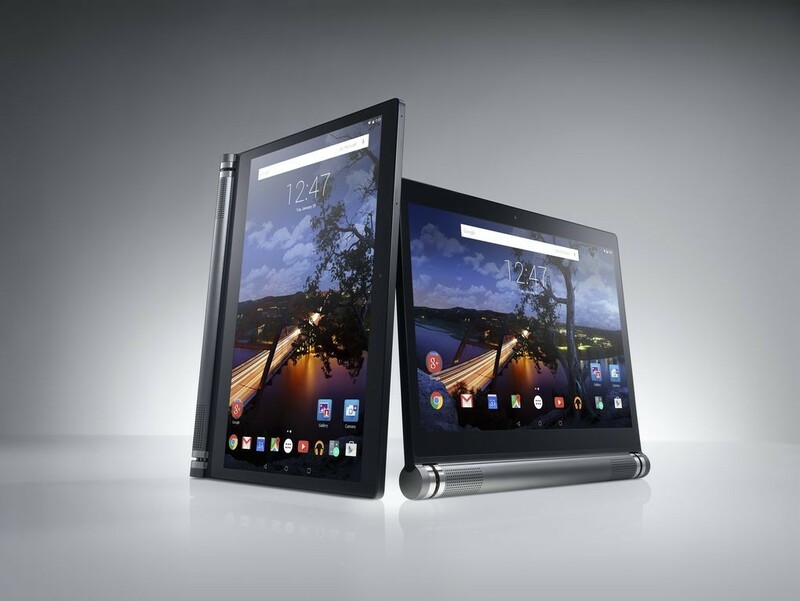 The tablet will be available in the U.S., Canada and China in May 2015. The keys are very responsive, the back-lighting is strong enough to be useful in a dim room, and it also has a trackpad that works well. It can be converted as a tablet and it can be folded around 180 degrees. It serves the need of Business people running all type of applications with ease and with greater results and productivity. The price is expensive yet it is offers value for money. YOGA TABLET 2 PRO: 13.3-inch QHD DISPLAY.